It's already December. It's 30 days left for the year. Time passes so quickly! The first day of every month is the City Daily Photo bloggers' Theme Day. The theme for this month is "waiting". Are you waiting for the year to be over? What have you been wanting to do and have been 'waiting' / 'procrastinating'? You still have 30 days to do it before the end of the year! Wow, that's long queue (or not). When I look closer, those re a Taxi. So I suppose they are waiting a customer to pick up. Very good night shot. Tripod? great image and it almost looks like matchbook cars. and I cannot believe the year is almost over. wow. I am not of a mind to hurry time along. It travels far too quickly as it is. I do like your matchbox cars waiting to pick up passengers. Are they at the airport? Yes, that's the middle of the queue, it does a u-turn over a overhead bridge. Yes, they are waiting to pick up passengers. 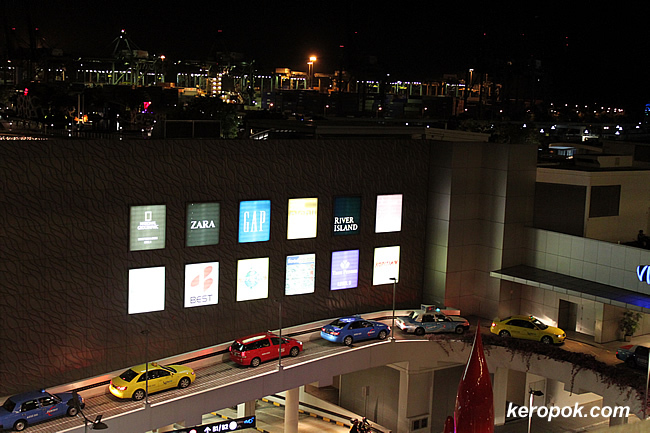 Not the airport, it's the shopping mall. It's near closing time of the mall, so these taxi drivers are smart to wait way ahead. Too right, time passes far too quickly. Hard to believe it's December already. This is such a good choice - taxis waiting. I'd not have thought of that. Super. I am always happy when returning from a trip (or arriving at a destination) to see a line of taxis WAITING to pick me up. These guys work hard and their wait must not be easy! Very nice pic & appropriate theme day post. I like all the different colours. And yes, they do look like toy cars! Hee, cute! I like how they're so colorful! Our taxis are mostly just white. For now, I'm contend to treat myself to a nice festive vacation after slaving really hard the whole year ! thank you for your comment in the singaporedailyphoto.com :)!